Add A WOW Effect To Any Activity! 4" glow sticks are easy for kids to handle. Great for dances, birthday parties, camping & more. Lanyards allow glow sticks to be worn as pendant necklaces. Glows for approximately 10 hours. 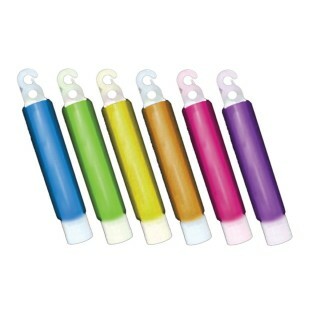 Smaller glow sticks are easier for kids to handle. Add a wow effect to activities like school dances, birthday parties, camping - or simply lighting the way! Glow sticks feature lanyards so they can also be worn as pendant necklaces. Glows for approximately 10 hours. Packs of 10. Please specify your choice of color when ordering. Colors include purple, green. blue, yellow, pink and orange. As mentioned above we marked the location of a group of campers who spent the night in the wood. The sticks helped us to locate them during our nightly rounds. We used these to locate campsites during the night. The glowsticks were a success.